Sometimes, life can be a bit crazy. It’s not always easy to find time to get the proper amount of sleep or eat as healthy as you should. I have recently been experiencing this between working at my day job, working at my seasonal job as a haunt actor at night, and doing other projects – my schedule has been a bit chaotic. You have to take opportunities as they come, because eventually, it’s going to be slow again, and you will be wishing you were working on those projects! So, how do you keep yourself going during the chaos? The Practical Artist wrote an awesome post called “Know Your Fuel“. You should definitely check it out. She touched on this subject, showing what she uses to keep herself fueled during projects. I, personally go for a different fuel. I have been really enjoying the new Starbucks Refreshers™. Disclaimer: I am not being paid to endorse this product. I am only writing about my personal experience. I am not a nutrition expert. My favorite flavor is the Orange Melon. I really like these because they give me energy without making me jittery. I also don’t crash after drinking these like I would with some energy drinks. I feel better about drinking these than I would other energy drinks, because the caffeine is naturally derived from green coffee beans. They taste really good too! They taste like a fizzy fruit soda. Plus, another great thing about the Refreshers is the nutrition information. There are only 60 calories per can! Plus, the Orange Melon Refresher contains 100% Vitamin C, 10% Vitamin A, and lots of other goodies. I like to load up on Vitamin C when I am running around a lot, because it prevents you from getting sick. Some actors I know like to take vitamin tablets. I do this sometimes when I don’t feel I am getting enough in my diet, but I try to avoid it. 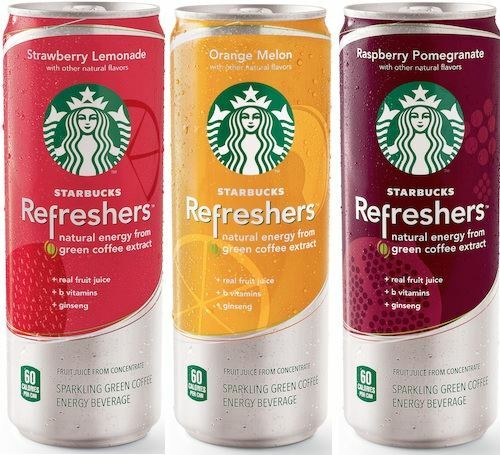 The only downside to Refreshers are the price. They are around $2.95 each, if you purchase them from Starbucks. They are convenient to find, considering there is a Starbucks on almost every corner – however, you are paying for the convenience. I usually only purchase a few cans for those days when I need an emergency pick-me-up. I wouldn’t recommend drinking these all the time, due to the fact that it is still an energy drink, and the price is rather high. I have tried to find a snack of some sort to go with my Refresher, but I am still experimenting. It’s hard to find a snack that fills you up, but doesn’t weigh you down. If you have the time, there are some other things you can do to rejuvenate yourself. Yoga, a long shower, a 20 minute power nap, etc. I would love to hear how you get energy, and I hope this was helpful! I tend to reach for a coffee, but these drinks sound tasty! I’m not a big coffee drinker, but I do occasionally like iced coffee! I’m really skeptical about caffeine…this sounds ridiculous, living on a campus with three different places to get coffee whenever I want, but I avoid anything boasting to boost my energy. I rely on random dancing, napping, loud music for bursts of energy!